Below is a bit more information for our first time campers. If you have any questions, please feel free to contact the registrar anytime, we'd be happy to help! Once you are registered, one of our long-time Folklore Campers will make contact with you (in the spring) to mentor you as you get ready for camp. They are also a great person to connect with for your questions. Overall we are a very inclusive camp.. and as a group will do our best to make your first camp experience a good one. On the first day of camp, just before our first Happy Hour celebration, there will be a special orientation for new campers which will help you get to know the facilities. Plus we do a general orientation at dinner that first night for everyone to introduce the camp staff and teachers, plus to share the general camp and Woodlands rules. The camp is set in a lush redwood forest nine miles inland from the spectacular coastline at Mendocino. The historic dance hall, dining room and lounge have wooden floors, fireplaces and electricity. Camper cabins are charming and rustic with a stone fireplace, 3 picture windows, a balcony, small closet, and four twin cots and mattresses. They do not have bedding, heat or electricity. Lanterns (battery) can be used for light in the cabins, NO candles are allowed! The cabins are clustered into three groups and each of those groups has it’s own bathroom facility with lights, electrical outlets, toilets, showers, and hot water. There is also a central utility room with a washtub, ironing board & iron. It is also not uncommon for some campers to use chamber pots in their cabins at night (depending on how far away the bathroom is from their cabin).. just saying. Campers frequently bring an amazing variety of things to furnish their cabins; throw rugs, pressure rods to hang curtains, cloth shower curtain or sheets for covering windows, small tables or TV trays for next to the bed, folding chairs, objects d’art, etc. Two cots can easily be pushed together to accommodate couples, and all the cabins should now have new mattresses on the cots which are actually pretty comfortable. Bringing “extra padding” to go on top of the camp mattresses is not a bad idea though.. since you'll be on it for a whole week. As for bedding, many people use sleeping bags, but bringing your own bedding from home with sheets, blankets, feather beds or comforters can make for a very cozy nest. Up to you. 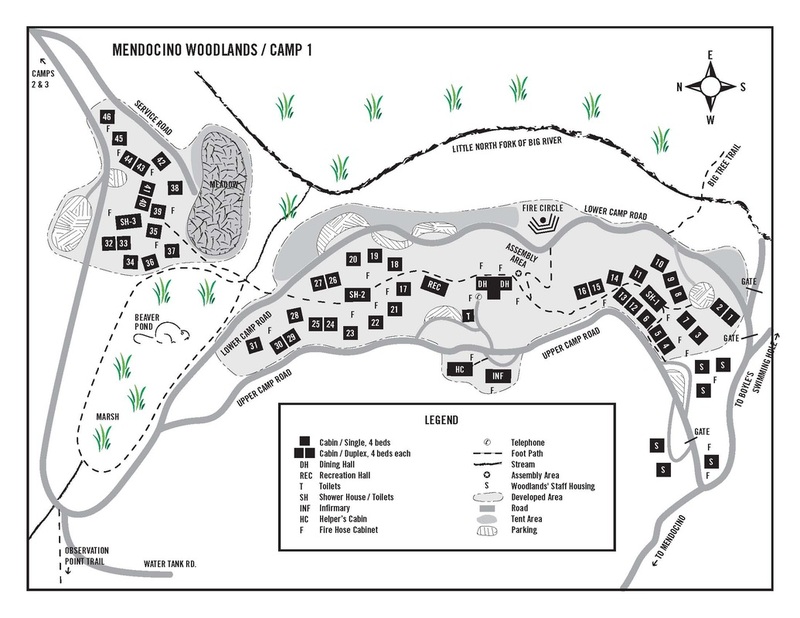 Below is a map of our camp's facilities at the Woodlands. Three sections of cabins clustered around bathrooms/showers (SH-1,2,3), all connected by a winding trail (hilly in parts) through the beautiful redwood forest. The common areas (all with electricity) are the Dance Hall (REC), the Lounge and Dinning Hall (both labeled DH on the map) and the kitchen which is between the two. The trails are hilly, but some cabins have steeper trails up to them than others. If you need flatter ground to your cabin because of health reasons, please communicate this to the registrar at time of registration. We do what we can to accommodate requests, but there's only so many of those type cabins, so no guarantee... but we will try. The sections break down into the "first section" of cabins (1-16), the "middle section" (17-31) and "across the meadow" (32-46) which is a bit of a walk over to the cabins, but for many well worth it. Especially with the beautiful Lilly Pond (w/beavers!) that many cabins have a view of, and for the quiet.